Ryan Carson is the CEO and Founder of Treehouse, where his mission is to bring effective, valuable and accessible technology education to everyone so they can change their lives and change the world. 3. Strive to show love, joy, peace, patience, kindness, goodness, faithfulness, gentleness, self-control and firmness. Ryan is active on every social media platform. You can learn more and connect with him at the bottom of this interview. Education gives people the power to create things. The idea is, you’re not just learning, you’re really picking up knowledge so that you can then use it and build things accordingly. 2. What does the future of education look like to you? Online, affordable, effective, accessible. Those are really the keys. Obviously, that’s what I am building with Treehouse. 3. What’s next in online, affordable, effective education? Do you think there will be a proliferation of educational experiences? Do you think it will be winner take-all? No. I think, basically, it’s going to be similar to what we see now, just because you have a group of higher level, higher quality schools. It doesn’t need to be a winner take all. There’s really different types of schools, that will serve different types of things. The basic methodology among the successful ones will be aspects I just mentioned. Affordable, accessible, effective, is really the key. 4. You run the Educate Yourself podcast. What does it mean to “educate yourself?” What is the importance of personalized development and personalized learning? 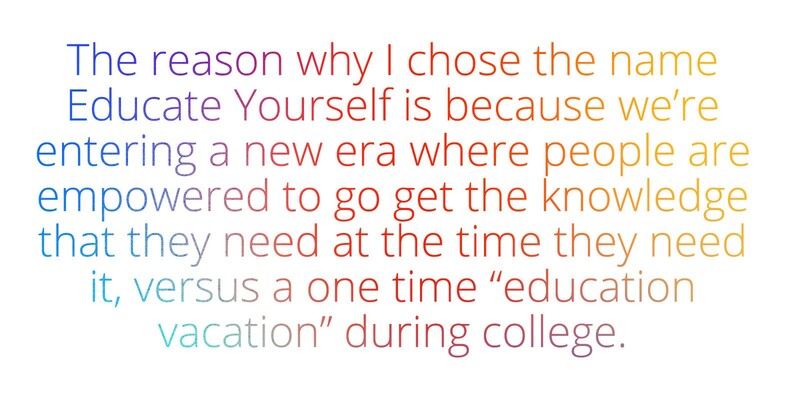 The reason why I chose the name Educate Yourself is because we’re entering a new era where people are empowered to go get the knowledge that they need at the time they need it, versus a one time “education vacation” during 4 years of college. I love the self-empowerment aspect of education where all the information is out there and accessible. Where as soon as you need knowledge you just go out and get it. It involves all those themes of being affordable, accessible and effective. 5. You always describe education as a set of skills, like a developer’s stack. What are the most important skills that a student of the future should be learning today? The first is learning how to learn. The idea that you need to be really flexible and adaptable and always soaking up knowledge. You must develop a learning mindset. Once you do that, then it really gives you the platform and ability to then learn anything. The second is tech literacy. You have to feel comfortable with tech, so that you can use it. 6. What are some of the most important lessons you’ve learned building Treehouse? What would you do differently, and what would you change? I would say, overall, thankfully I wouldn’t change a whole lot. We started off affordable. We started off by having full-time teachers. We didn’t crowd source our curriculum. I’m really glad we made some of those key strategic decisions. I would do them again. I would say that it’s very important to invest heavily in your curriculum and build a curriculum that is cohesive and updated and curated. So, really focusing hard on that is, I think, really important and a lesson I’ve learned. 7. Who is one historical or public figure, live or dead, that you admire and why? I really admire Elon Musk. 8. What is the greatest problem facing our world today and what’s one way in which you think we could solve it? One of the greatest problems is the one that I’m working on which is the lack of access to family wage paying jobs. Just the inability for people to get them, even though they’re there. I think by opening the access lane and removing the toll booths, i.e the universities, I think it will cause true societal change. It’s really exciting. Just tons of benefits, massive growth to GDP. There’s just a ton of it. So for me, it’s all about jobs. People need jobs. And People need to be trained for jobs. That’s why there is political unrest from the last election, so much of that is related to this fundamental human problem.